There are advantages to tuning your guitar by ear. Why Tune a Guitar by Ear? Keeping your guitar in tune is pretty important, and if your instrument is constantly out of whack, you’re setting yourself up for a bunch of problems. A badly tuned guitar means your practice sessions will be less productive when chords and scales don’t sound quite right. If you play in a band, you’re going to throw off your whole group. Even beginners should care about keeping their guitars in tune. You may think it doesn’t matter when you are first starting out, as long as your fingers are in the right places. However, learning to separate good sounds from bad is a big part of a newbie’s evolution on the instrument. If all you are getting is bad, dissonant sounds, you’ll never know the difference. Fortunately, tuning up a guitar isn’t hard, and it doesn’t take a lot of time. There are inexpensive chromatic tuners that make the process a breeze, and some amplifiers even have built-in tuners. I have several digital tuners and a few amps with tuners, but my preferred method has always been to tune by ear, comparing one note to another on the guitar itself. The method I’ll present in this article is well-known to most intermediate and beyond guitar players and can be used on both electric and acoustic guitars. If you are a beginner it may seem strange at first, especially since you can simply use a chromatic tuner. But, I think beginners would be smart to experiment with this method instead of constantly relying on electronic tuners. 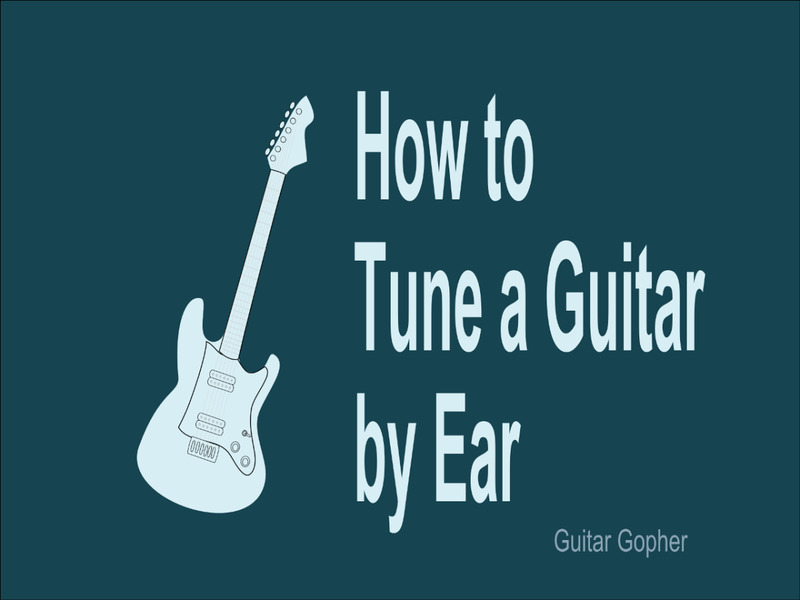 Once you get it down it is just as quick and easy as using a tuner, but it comes with the added benefit of training your ear to recognize the “right” sounds coming from your guitar. In my opinion, having a better ear makes you a better musician. Along that way of thinking, in this article, I’d also like to get into the nuts and bolts of tuning a guitar by ear, just a little bit. It would be simple to just present the tuning method and leave it at that, but I think it helps to understand why things are the way they are, even if it means dipping into a little music theory. The more you know about the guitar the better you'll be. So, let’s get to it. Effectively tuning by ear means understanding how the guitar strings relate to each other in standard tuning. As popular as the guitar is, it is somewhat of an oddball instrument. Most other stringed instruments, such as the violin and cello, are tuned with strings that relate to each other in perfect fifths. In a nutshell, this means a properly tuned open string is the same as the fifth note of the major scale for the string next to it. If this doesn’t make sense to you it is okay. The point is, a violin’s tuning is nice and easy to understand—perfect fifths straight across. This means if one string is in tune, you can tune the others using that string. In fact, in an orchestra most stringed instruments tune up by tuning their A string to a reference note provide by another instrument (more on reference notes in a bit). They then tune the rest of their instrument to that note. Tuning for a guitar is a little more complex, but the idea is the same. Once we get one string at the correct pitch, we will tune the rest of the guitar to that string. 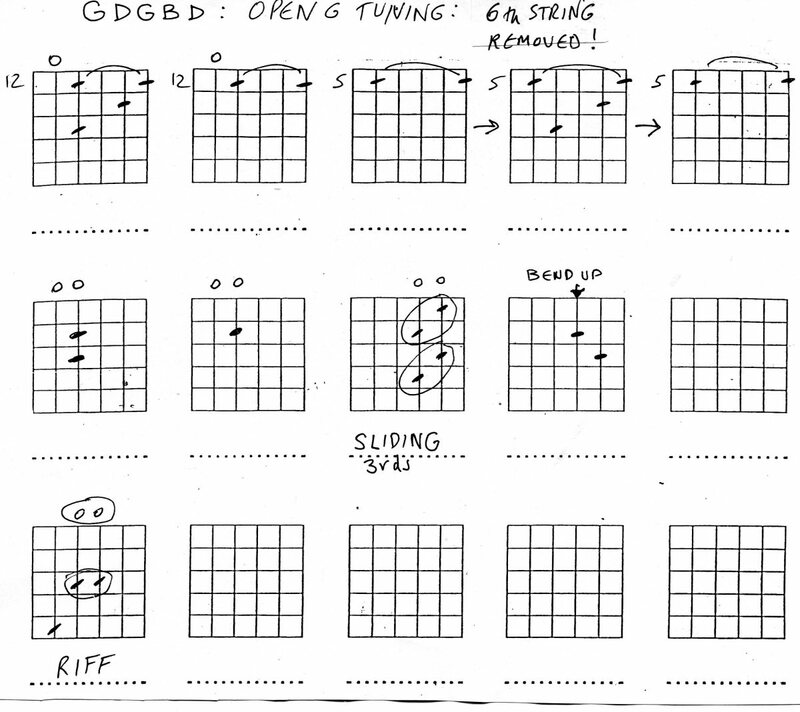 The open-string notes for standard tuning, from the sixth (thickest) to first (thinnest) strings, are E-A-D-G-B-E. If you don’t know them by heart, you should memorize them. This is the gateway to learning the notes of the fretboard! This isn't perfect fifths straight across, but instead: perfect fourth, perfect fourth, perfect fourth, major third, perfect fourth. Thus, the notes E-A-D-G-B-E boil down to: E – A (the perfect fourth of E) – D (the perfect fourth of A) - G (the perfect fourth of D) – B, (the major third of G) - E (the perfect fourth of B). This may be confusing, but remember: For the purposes of this lesson you don’t need to know what a perfect fourth or a major third or a perfect fifth interval is, only that every string on the guitar has a definite relationship to the string next to it. 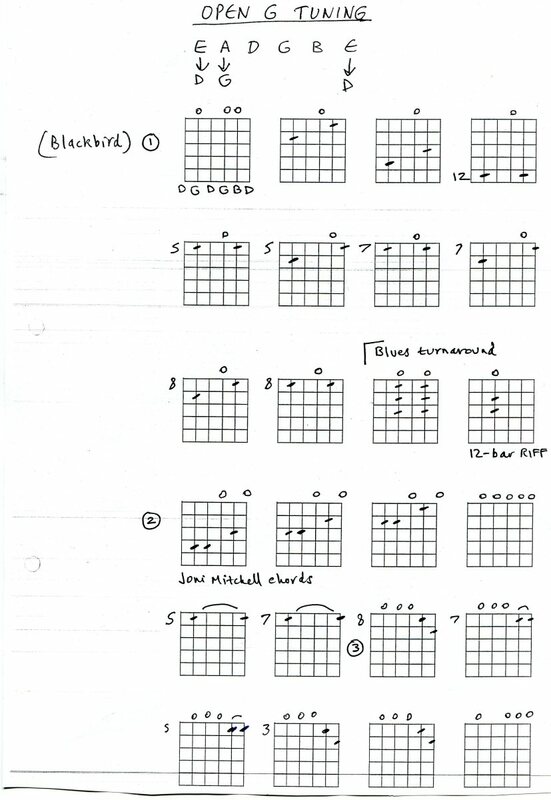 We can use this information to tune the guitar, but first thing is first: To tune your guitar by ear, you first need to establish a reference note. As I said above, stringed instruments in an orchestra tune to a reference note provided by another instrument in the orchestra, typically an oboe. Don’t worry; I’m not going to tell you that you need to go out and get an oboe in order to tune your guitar. But I think this is a good way to illustrate how reference notes are used, and why learning to tune by ear is so vital. Here’s a question to ponder: If everyone in an orchestra is tuning to the note from a single oboe, what if that oboe is slightly out of tune? The answer: It doesn’t matter. While it is fairly certain that professional musicians in an orchestra are going to be in perfect tune, what really matters is that all of the instruments are in tune with each other and with themselves. If the entire orchestra is slightly sharp or flat it won’t really hurt anything, as long as they sound good together. For guitar players there are few takeaways here. First, if you play in a band with another guitar player, a bassist or other instruments, the most important thing is for you all to be in tune with each other, and working off the same reference note. If you all try to tune separately using chromatic tuners I’d bet you’ll find you’re each a little off when it comes to the sound of the group as a whole. The second point is how important it is for your guitar to be in tune with itself. By that I mean it is more important to focus on how your guitar sounds when you play chords and scales, as opposed to whether or not each string is technically in perfect tune according to a tuner. Tuning by ear ensures that your guitar is in tune with itself, not just some readout on a tuner. This is especially true when you are practicing on your own. It doesn't matter if your guitar is slightly sharp or flat as a whole. It is more important that it is in tune with itself. In fact, if you are trying to learn music from an audio recording there may be times when you adjust your entire guitar so its slightly off, so that you can hit the exact notes you hear in the recording. In this case, you would get your reference note from the recording itself. So, in ordinary situations where do you get your reference note? 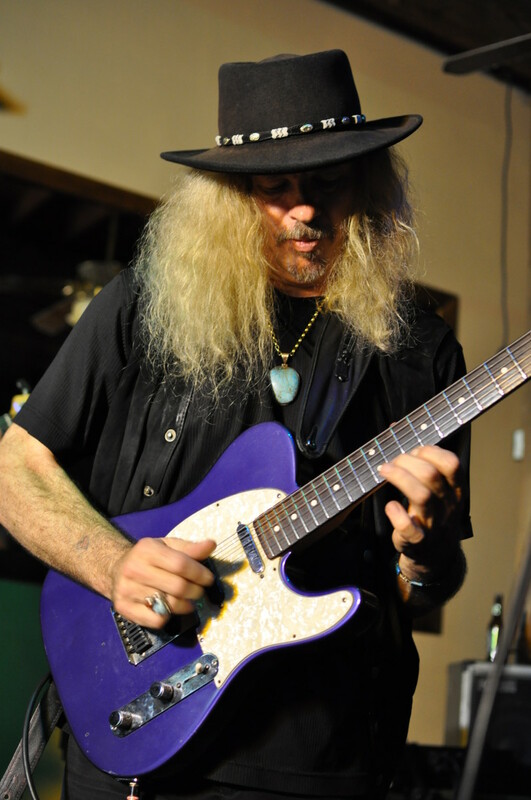 Guitarists have used numerous methods over the years. You can use a tuning fork or a pitch pipe, though those methods are somewhat outdated and annoying. You can tune to another instrument you know is already at the correct pitch, such as another guitar or a piano (or an oboe, if you have one handy). Or, you can use a chromatic tuner. Yes, it’s okay to use a digital tuner to establish your reference note. It’s actually a pretty good idea. Once you get your low-E string to the right pitch using a tuner, you can tune the rest of your guitar by ear. If you play in a band with another guitar player, a bassist or other instruments, the most important thing is for you all to be in tune with each other, and working off the same reference note. 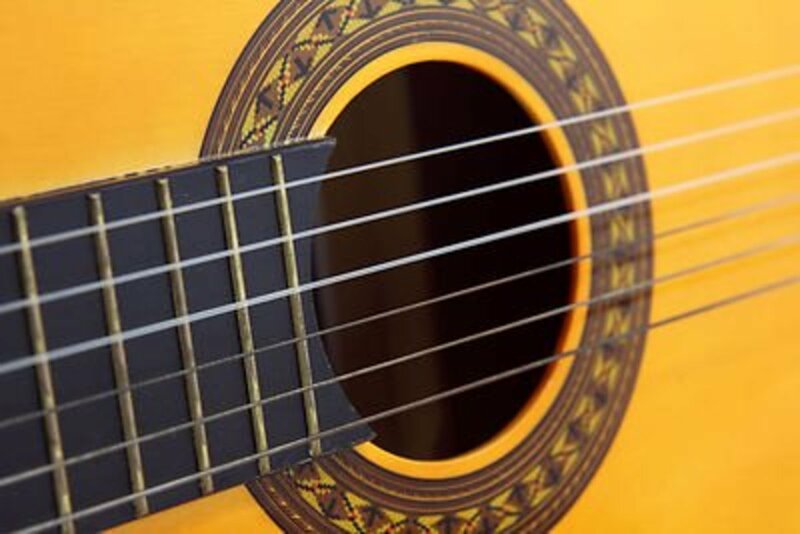 As we discussed above, the relationship between the guitar's strings in standard tuning is fourth, fourth, fourth, third, fourth, or E-A-D-G-B-E. Once we get our low-E string in tune using a reference note, we can then tune the open A string to the E string - if we know where to find the perfect fourth interval of the E major scale on the sixth (E) string. We are looking for an A note, the perfect fourth of E. Where is the A note on the sixth string? That would be at the fifth fret. Put simply: The E string played at the fifth fret is an A note - the fourth interval of the E major scale. It is the exact same note as the open A string. They are both A notes at the same pitch, and they should sound exactly the same. If they do not, you need to adjust the tuning peg for the A string until it sounds the same as the note you are playing on the low-E string. Tune your open 5th string (A) to the 5th-fret note of the 6th string (also A). The easiest way to do this is to fret the sixth string at the fifth fret and strum across both the sixth and fifth strings, letting them ring. You can then reach across with your picking hand and adjust the tuning peg. If they are out of tune you will hear a fair amount of dissonance between them, but as you turn the peg the notes will blend together. You can see how this process serves to improve your ear. It teaches you to recognize dissonance between notes, even when they are fairly similar. Some guitarists may pick this up easily, where others may have to put some work into it. Once you have the A string in tune, you’ll tune the D string to the A string. 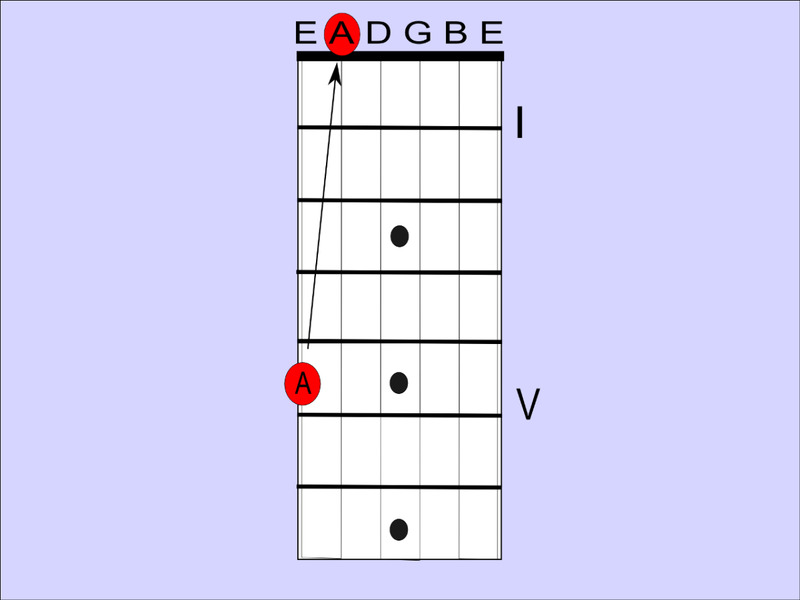 Again, the fifth fret note of the A string is D, the same as the open D string. The fifth fret note of the D string is G, same as the open G string. 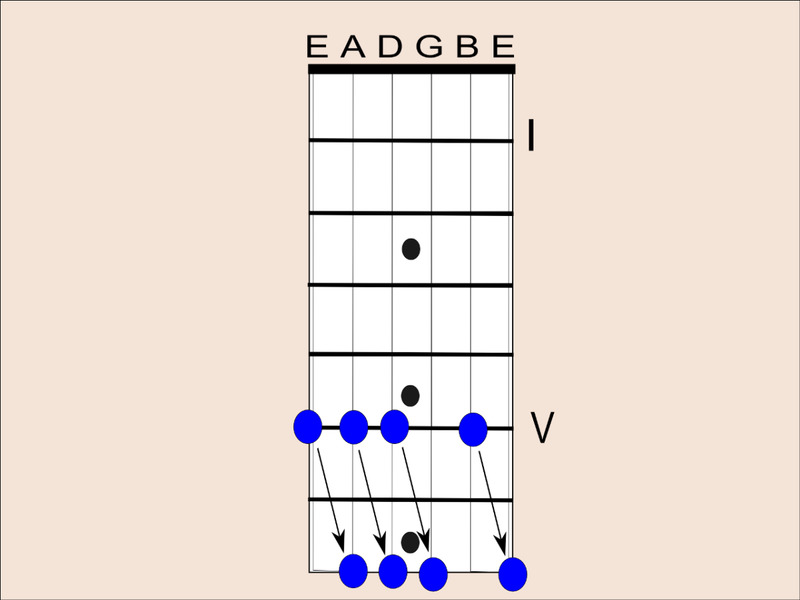 Tune the open D to the 5th fret note of the A string, and the open G to the 5th fret note of the D string. The B string throws us a slight curveball. This string is tuned the third interval of the G major scale (the G string next to it), not the fourth interval. All that means is that instead of playing the fifth fret of the G string to get a B (which would actually be a C) we will play the fourth fret, which is the same B as the open B string. Then it is back to business as usual: The fifth fret on the B string is an E note, the same as the open E for the high-E string. Tune the open B string to the fourth fret note of the G string, and the open E to the fifth fret note of the B string. This may seem clunky at first, but once you get the hang of the process it really doesn’t take any more time than using a chromatic tuner. The method above is the simplest way to tune your guitar by ear, and for beginners it is the way to go as you are learning to recognize the sounds your guitar is supposed to be making. A somewhat more advanced method of tuning a guitar by ear involves the use of natural harmonics. 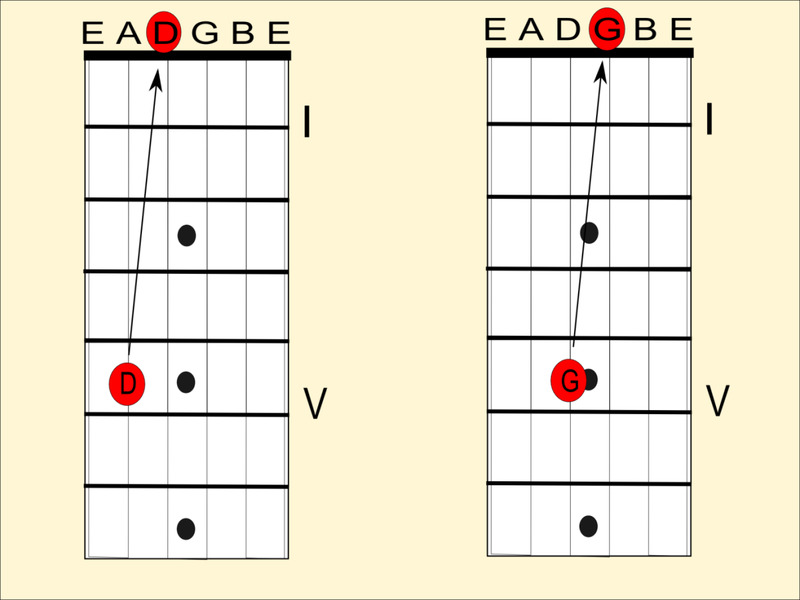 Natural harmonics occur at different places around the fretboard, and you can play them by gently touching the string in those spots and plucking a note. For the purposes of tuning, we’ll use the natural harmonics occurring above the 5th and 7th frets. The execution is similar to the method outlined above. You’ll establish your reference note first, which means getting your low-E string to pitch. Then, you’ll pluck the 5th fret harmonic on the E string, and the 7th fret harmonic on the A string. These should ring as the same note, and if they don’t you’ll have to adjust the A string. Follow suit with the remaining strings, the exception again being that pesky B string. Here, you’ll match the 7th fret harmonic of the low-E string with the open B string (not a harmonic). You can then resume the harmonic tuning for the high-E string, matching the 7th fret harmonic with the 5th fret harmonic on the B string. 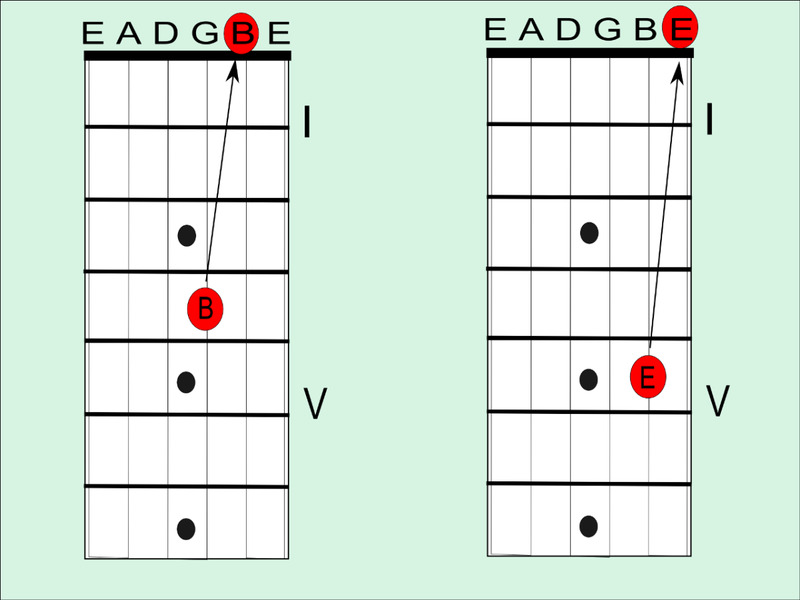 You can tune your guitar using natural harmonics located at the 5th and 7th frets. 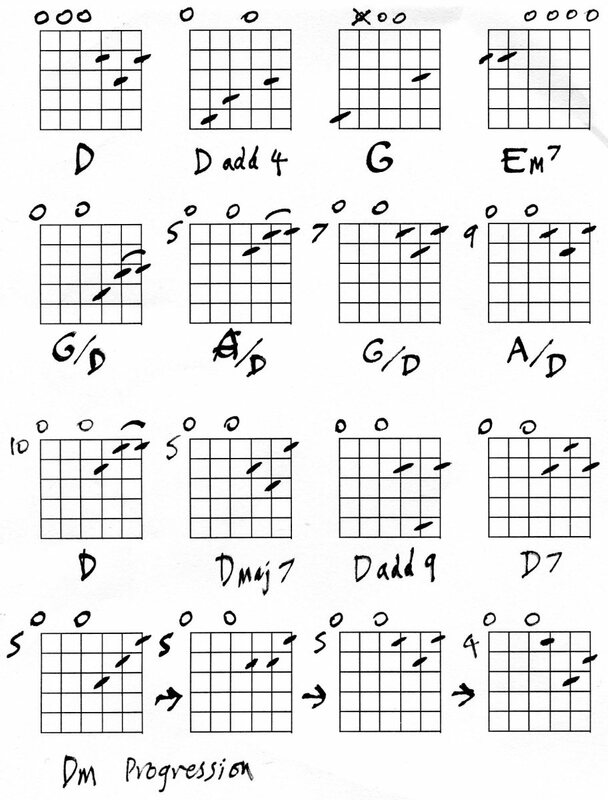 There are some other methods you can try as you get more accustomed to chords and scales. My favorite way is to use fourth and fifth dyads. A dyad is like a chord, except there are only two notes, and they are named after their interval on the major scale. When you play the open low-E and A strings together you are playing a dyad. As we know, these two strings are fourth intervals in relation to each other, so this dyad could be called an E4 – E for the tonic note, and 4 for the perfect fourth interval of the E major scale (the A note). Once you are familiar with how these dyads are supposed to sound, you can easily use them to tune your guitar. You can do the same with chords, though the presence of more than two tones makes it a little more convoluted. After a while, you’ll find it’s easy to pick out guitarists who mindlessly tune to a chromatic tuner. 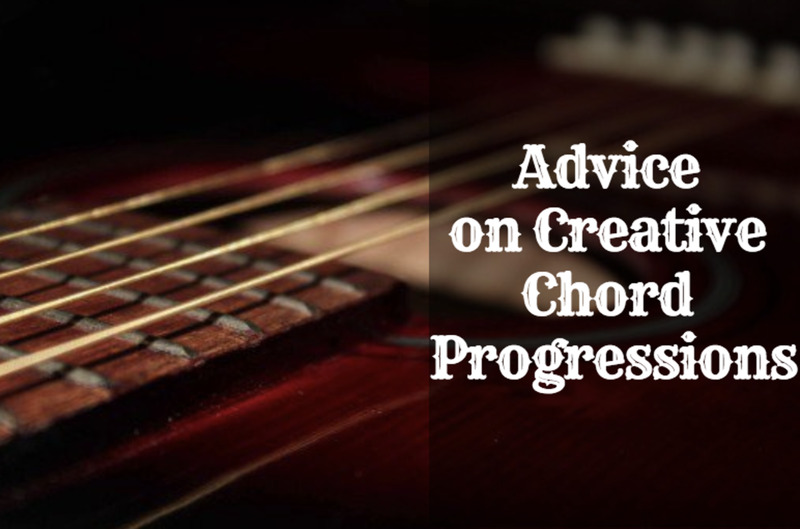 Chords will sometimes sound a little off, with just a slight dissonance where it doesn’t belong. 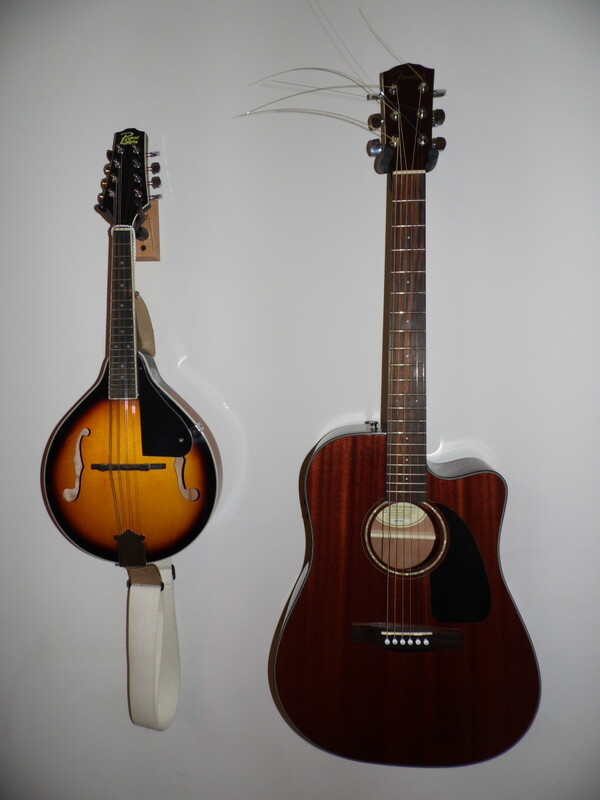 So far this article has covered tuning your guitar to standard tuning – EADGBE. However, there are all kinds of tunings out there to experiment with. In most cases the process is the same. You’ll want to get one string in tune, and tune the rest of the guitar accordingly. Of course this means you’ll have to know the notes of the fretboard. Some professional guitar players (particularly metal players) will tune down several steps and/or use very heavy-gauge strings in an effort to get a certain sound. Making a change like this to your guitar also means properly adjusting the neck and the bridge, and if you don’t know what you are doing you ought not to try it. Instead, take your guitar to a tech at a local shop that can set it up with the strings and tuning you want. One tuning you can experiment with without much worry is Drop-D. This is where the open E string is detuned a full step, making it a D note. The advantage here is a heavier, darker sound, and the ability to play power chords on lower strings with one finger. If your guitar is already in standard tuning, dropping the E string to a D is super easy. Simply play the 7th fret on the 6th string, which is a B, and tune it down until it matches your open A string. Your B is now an A, and you’re open E is now an open D.
Whatever process I use to tune my guitar, I always like go through it at least twice. This is because changing the tension on a guitar string changes the tension on the neck, and pulls the string across points of friction like the nut and the saddle. By the time you get through the process you might find that strings you thought were in tune are out of tune again. Sometimes it may take several attempts to get everything right. This is especially annoying if your guitar was very far out of tune to begin with, or if you’ve just installed new strings. If you find it very hard to keep your guitar in tune, or if notes seem okay in one spot of the fretboard but off in other areas, it may be time for a setup. If you can’t do the work yourself, you can take your guitar to a shop to have the intonation, neck, bridge and other adjustments made where necessary. A poor setup can and does affect tuning, and all guitars need a little work now and then. Finally, if you are having trouble tuning your guitar by ear and find you need to rely on a chromatic tuner, there is nothing wrong with that. Modern electronic tuners are fairly accurate, and you can use them to make your life easier. Still, I’d suggest at least experimenting with the methods in this article. Remember, the intent is not only to tune the guitar, but to improve your ear for musical tones.